Last fall, Mr. and Mrs. Hartigan got the high bid on the Ultimate Fire Fighter Experience during the United Way Radio Auction. 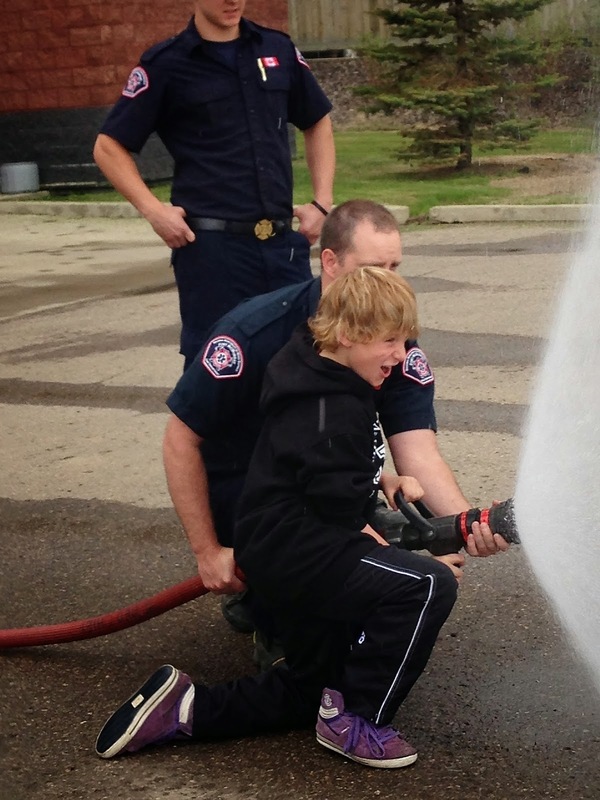 It took some time to align schedules, but yesterday was the day that Carter and Andrew, their sons, got picked up at their school, rode in a fire truck to Dairy Queen where they enjoyed some frosty treats courtesy of the Fort McMurray Fire Department, then went to Fire Hall #4 in Timberlea for a tour. 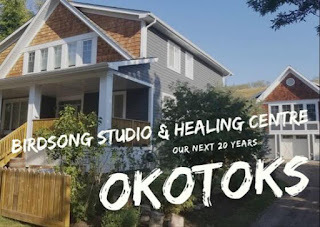 In my new role with the United Way, I got the pleasure of tagging along, chronicling the visit in pictures, and by osmosis, getting the best tour of a fire hall ever! 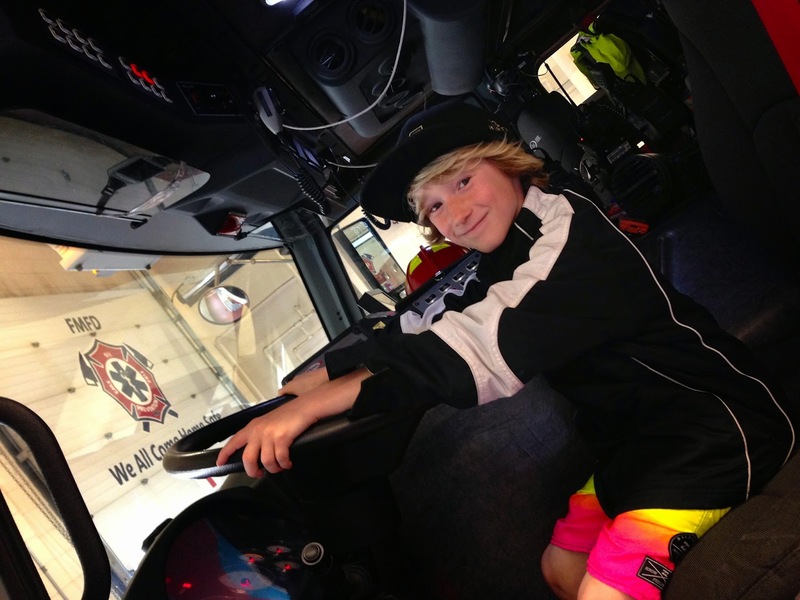 Getting up close and personal with a fire truck is a quintessential kids paradise. There are so many hidden storage spaces filled with the niftiest devices, tools and fire fighting gear. Andrew and Carter were able to hold the heavy life-saving tools, feel the weight of the fire fighters jacket and helmet, and get the inside scoop on some of the latest technology. We learned about the fire bomb, a small little device that is thrown into the heart of a dangerous fire and emits a gas that almost instantly snuffs out the flames. Expensive, with a one-time use, it does a remarkable job of saving lives and property. "We were at a basement fire in Thickwood a couple of days ago," said one of the firemen. "We were delayed in getting completely set-up, so we broke a window and tossed in the fire bomb. When we got in, there wasn't a single flame. It saved the house." I went online to try and find a picture, but was unsuccessful. The device bore a striking resemblance to the Staples "That was easy" button, just larger. That was the only thing that popped into my mind as I looked at it. 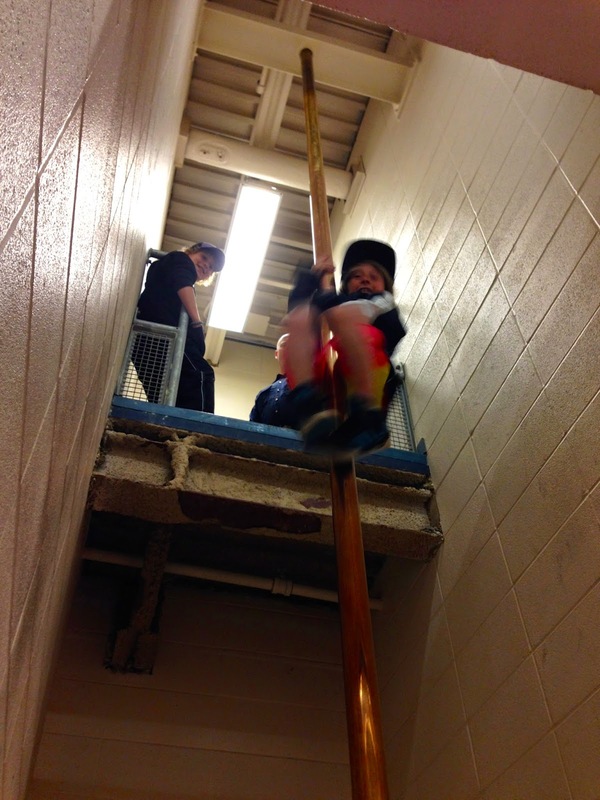 The boys got to slide down the fire pole, several times. I was too scared, or shy, perhaps a little of both. 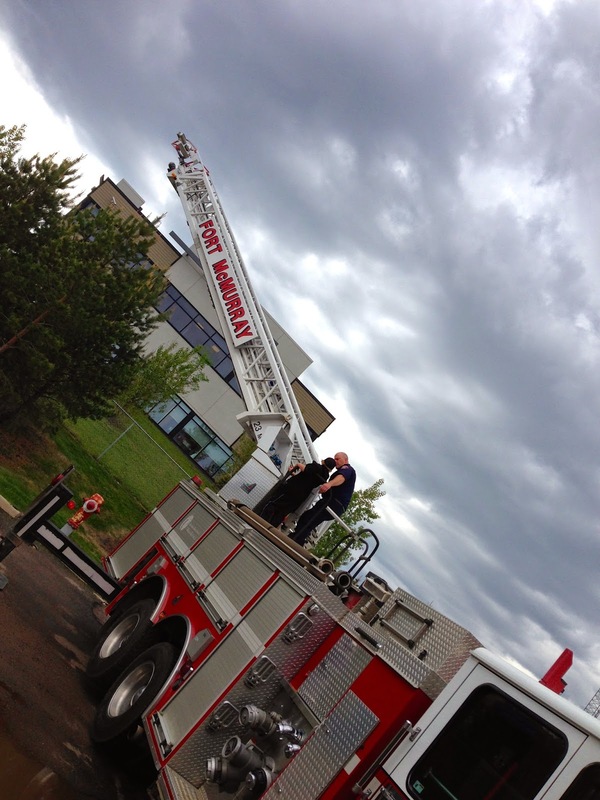 They were also able to climb up on the big ladder truck and help extend it up 70 feet. As I was standing on the ground talking to their mom, looking way up to the top of this thing, imagining what it would be like to be up that high, my stomach started to turn. "When I was young, heights didn't bother me in the least," I said. Carter and Andrew were completely attentive and in awe through the entire visit. "They are never this quiet," said Mom. It was clear that they were experiencing something pretty unique. 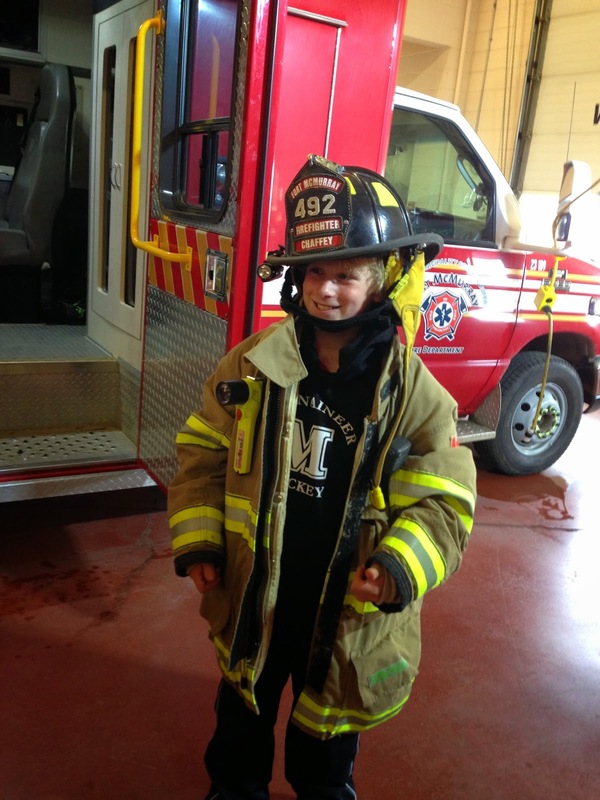 The Ultimate Fire Fighter Experience turned out to be a big hit. If it ever comes up for bids again during the Radio Auction, I'd suggest jumping all over it. I was just a tag along, but it still felt like the ultimate birthday present (I turned 47 yesterday). I want to personally thank Carter and Andrew for allowing me to snap some pictures and capture their adventures. 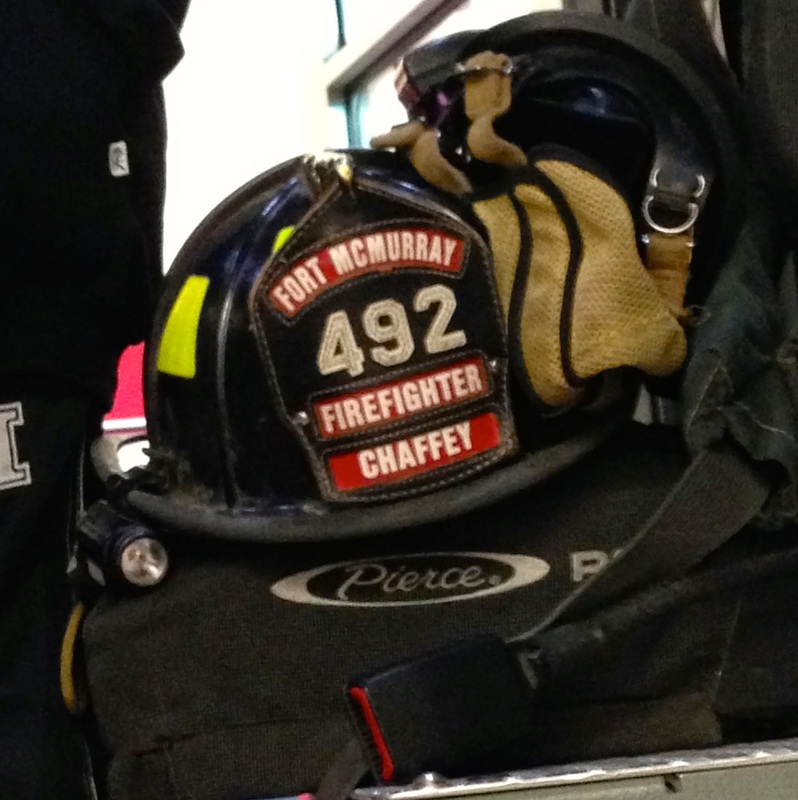 I'd equally like to thank the amazing members of the Fort McMurray Fire Department for providing an experience that was Ultimate...with a capital U.